“Le Ride” is a cycling documentary, which follows two cyclists, Phil Keoghan (also the director of the film) and his friend Ben Cornell as they attempt to recreate the original route of the 1928 Tour de France. Averaging 240 km a day for 26 days, Phil and Ben traverse both the unforgiving mountains of the Pyrenees and the Alps, on original vintage steel racing bikes with no gears and marginal brakes. Le Ride – Official Trailer. 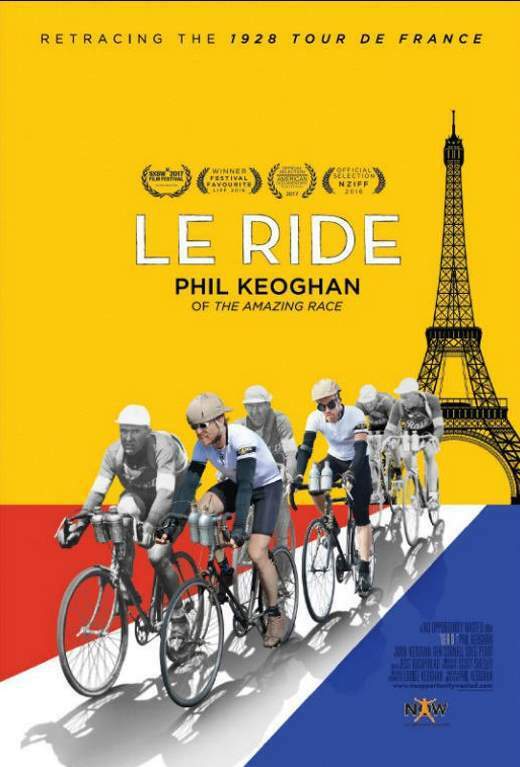 TV personality Phil Keoghan retraces the 1928 Tour de France riding an original vintage bicycle, with no gears, as he tells the forgotten ‘underdog’ story about the first English speaking team to take on one of the the toughest sporting events on Earth. Why 1928 Tour de France? The early tours were brutal. Henri Desgrange, the first organizer of the Tour de France and the “patron” of the Tour until 1936, has had strict rules. Once he said that his ideal race would be so hard that only one rider would make it to Paris. Until 1930 he demanded that riders mend their bicycles without help and that they use the same bicycle from start to end. Exchanging a damaged bicycle for another was allowed only in 1923. Desgrange stood against the use of multiple gears and for many years insisted riders use wooden rims, fearing the heat of braking while coming down mountains would melt the glue that held the tires on metal rims (they were finally allowed in 1937 after Desgrange retired from organizing the Tour de France). In 1928, the first English speaking team has entered the Tour: Ravat-Wonder-Dunlop. There were four riders in the squad, three Australians – Sir Hubert Opperman, Ernie Bainbridge, and Percy Osborne; and a New Zealander, Harry Watson. The documentary takes inspiration from the remarkable true (but untold) story of these riders. They arrived after six weeks at sea, under-trained and under-resourced, untested and completely written off by the French media. The 1928 Tour was the toughest in history – a hell on wheels race of attrition. The shortest stage was 119 km and the longest 387 km. Other teams had 9-10 riders but the Australasia squad had four. Only 41 finished out of 161 starters yet remarkably three were from the Australasian team. Opperman finished in 18th place, Watson 28, and Osborne 38. Bainbridge would do his best to hang on, but even though he may have been a good rider in the past, the passing years had taken most of his speed, and he would generally go off the back after 50 miles or so. Le Ride also contains amazing scenes from the 1928 Tour de France, the 22nd edition of the race, taking place from 17 June to 15 July. It consisted of 22 stages over 5,376 km (3,340 mi). The 1928 Tour was won by Luxembourgish Nicolas Frantz (4 November 1899 – 8 November 1985), and it was his second consecutive win. He held the yellow jersey from beginning to end, despite an incident three days before the end of the race. Frantz had a mechanical failure between Metz and Charleville and had to finish 100 km of the stage on an undersized women’s bicycle, resulting in a loss of 28 minutes. Regardless, Frantz won the tour, with his Alcyon team winning the team trophy and having riders finish in second and third places. Official poster of Le Ride.